With Our Products, Anyone Could Be A Possible Customer! Build Your Business With Genusity! people are starting their own home-based business. As you can see, with Genusity, you should be able to build larger and stronger teams which in turn, creates an opportunity like never before for you! EASY QUALIFICATION MEANS YOU GET PAID! Join GENUSITY as an Associate. Once you do, you'll be able to enjoy products and a one-of-a-kind, HIGHEST PAY-OUT Compensation Plan that pays you up to... 94% COMMISSIONS! Anybody Can Create a 20 Club! FIRST...You want to purchase the 20 Club Package That's Right For You! NEXT...Enroll 4 New Associates who also join the 20 CLUB and purchase a 20 CLUB PACKAGE! IT'S TIME FOR A CHANGE! IT'S TIME TO MAKE MONEY! 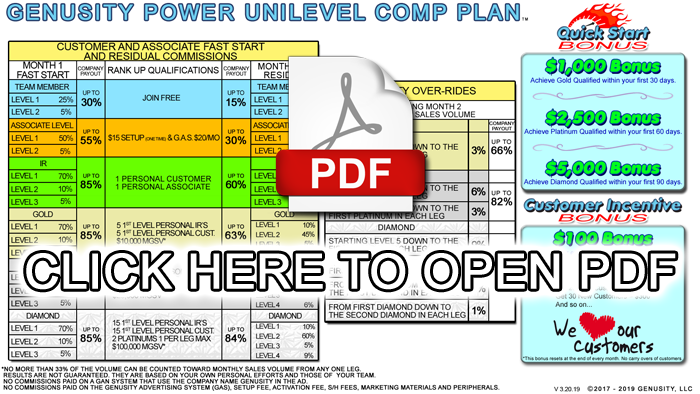 GENUSITY'S POWER UNILEVEL Pay Plan's 10% First Level pays you $10 commission on every CLUB MEMBER and the 45% Second Level pays you $45 per CLUB MEMBER. You'll be purchasing the HIGHEST QUALITY products at the LOWEST prices around...GUARANTEED! And, you'll be earning the HIGHEST COMMISSIONS in the Industry...GUARANTEED! BIG BONUSES ON GEOMETRIC GROWTH! There's more than just 2 LEVELS! GENUSITY has 4 LEVELS of Residual Commission along with an Industry Leading Infinity Bonus that pays up to 9%. Couple that with up to 85% DAILY FAST-START BONUSES, Up to $8,500 in QUICK START RANK UP BONUSES and CUSTOMER INCENTIVE BONUSES that will BLOW YOUR SOCKS OFF! This CLUB gives the Part-Timer the opportunity to DUPLICATE and build an income with a proven CLUB PLAN. This is NOT a guarantee of income. Your results may vary and will depend on how well you are at getting 4 people that will get 4 people each. When you sell a Beacon or CBD Product, you earn a daily fast start commission. Also, when any of your personally enrolled Associates sell a Beacon or CBD Product, you again, earn a daily fast start commission. Then, when their Beacon Service or CBD Order renews the 2nd month and beyond, you earn a monthly residual income.